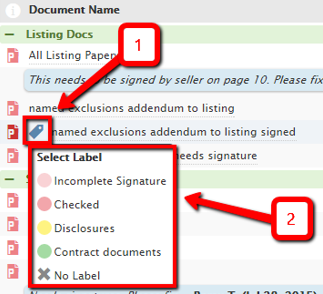 Use custom color-coded document labels on your transaction's docs for easy sorting and categorizing. Click directly on a label name or click the gear, then [Edit Label].Then, give that colored label a name. Enter document types, custom categories, statuses, initials of admins, or whatever classification of docs meets your office’s needs. Go to a transaction's docs and hover over a doc name until a label icon appears. Click it to select the desired label or to remove a label. Use the same process on Unassigned Docs. Learn how document labels can help streamline your work processes as we cover best practices and special use cases for the labels.